Large flat dry rock biv in the northern head of the Wild Natives, 10-15 minutes from the Wosley Pass. A single massive boulder on the true left of the North Branch of the Wild Natives just below the pass surrounded by smaller boulders. The sheltered platform is on the western side and seems protected from all wind directions (I was present in heavy westerly rain and it remained dry). 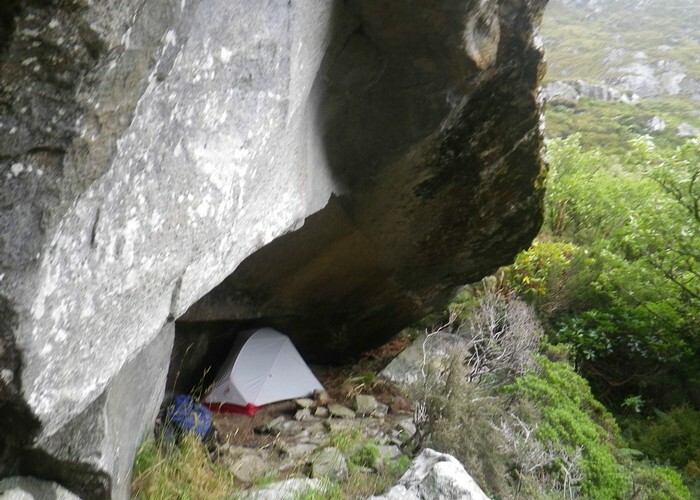 Room for 1-2 tents on flat sandy platform plus much more rocky space for cooking & eating. Water can be hard to access - nearest is 80m away in very thick scrub. Fill up before you arrive. Worsley Rock Biv • By madpom. Licence: cc by. Added 25 February 2018 by madpommadpom. No revisions.